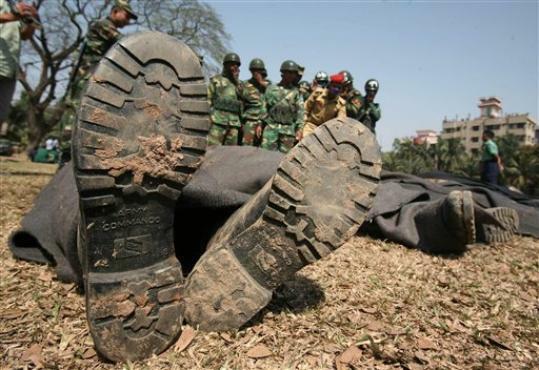 Speculative comments on the recent 25th-26th February rebellion in the ranks of the Bangladesh Rifles (BDR) auxiliary unit, which has so far claimed nearly 150 lives. Whatever the BDR mutiny was, it seems unlikely that it was merely a simple labour dispute or incident of class conflict. The methods used by the rebels, such as slaughter of highest ranking officers seem surprisingly extreme ones to be immediately used in a situation where one wants to maintain bargaining power; especially where one's adversary is the entire - far better equipped - national army and the slaughtered were overseers allocated from that army. These oppositions embody opposing views as to what kind of society Bangladesh should be and are contested at various levels, both politically and culturally. During the War of Independence there was a left wing element within the army and politics. But since the coups of 1975, in the face of jailings and repression, leftist and liberal elements have (with a few exceptions(1)) largely fragmented and often submerged themselves within the Western-financed NGO sector. These groups promote micro-credit schemes, partly as a means of encouraging independence from large landowners in rural areas and for greater economic and social independence for women. Funding is provided to teach and implement small-scale improved farming techniques, co-operative or individual household workshops and subsequent distribution networks etc. They also sometimes act as proxy trade unions/legal advisors in cities. They have often used traditional cultural drama and song folk forms(2) in village meetings to spread their liberal ideology of cultural tolerance and entrepeneurial market activity. On the other side of the ideological battleground are the Saudi Arabian-financed Muslim NGO groups who campaign for fundamentalist values and a traditional submissive role for the poor and women in particular. (Some have also been linked to terrorist activities(3)). As one recent example; just prior to the election, the threats of Muslim fundamentalists forced aviation authorities to remove Baul (folk singer) sculptures from outside Zia airport. The sculptures represent an aspect of cultural history unacceptable to fundamentalism. This enraged liberal and artistic groups(4). The more than two million Bangladeshi urban female garment workers with a relative economic independence are, for the fundamentalists, particularly unacceptable evidence of the corrupting influence of modern society. For these reasons they have sometimes physically attacked NGOs, unions and the projects they sponsor. This ideological war manifests in various political and cultural issues. The recent election winners, the Awami League (AL), are considered a more liberal and secular party (by Bangladeshi standards, though historically just as involved in corruption) than their Bangladeshi National Party (BNP) opposition, who have a recent history of electoral alliances with fundamentalist groups. Nearly 40 years later, there are still regular calls for 1971 'war criminals' - those 'national traitors' implicated in bloody War of Independence massacres - to be prosecuted. The geopolitical dimension of internal feuds within the Bangladesh army has to do with the India-Pakistan rivalry in South Asia. From the very beginning, the "pro-Islam" segments of Bangladeshi society and the army had sympathies for Pakistan and opposed the independence of Bangladesh in 1971. The JI [Jamaat-e-Islami Islamicist party] leadership was at the forefront of mass atrocities on behalf of the Pakistan army on the eve of Bangladeshi independence. When the secular Hasina returned to power in January, she implemented a bold initiative to seek war crimes prosecutions with UN assistance of the JI figures who spearheaded the killings in 1971. Just a few days prior to the BDR mutiny, trials had begun against the JI chief, Matiur Rahman Nizami, and nine others for "carrying [out a] massacre during the war of independence in 1971". Hasina's steps against the fundamentalists were based on detailed investigations and a collection of documents over a long period by non-governmental organizations and associations of former freedom fighters. That the JI and JMB [ Jamaat-ul-Mujahideen Bangladesh - another Islamicist group] would hit back in the form of terrorist attacks or serial bomb blasts in the country was expected, but few thought that they could attempt a mutiny through sympathizers in the army and the BDR. Past history would suggest possible involvement of the fundamentalists; on August 21, 2004 a grenade attack on a rally held by Sheikh Hasina killed 23 people; grenades were thrown from buildings down into the crowd of 15,000. On August 17, 2005, near-synchronized 500-bomb blasts of improvised explosive devices in 63 out of 64 administrative districts targeted mainly government buildings and killed two. Islamist terror group JMB claimed responsibility, aiming to press home JMB's demand for a replacement of the secular legal system with Islamic sharia courts. So the fundamentalists would be obvious initial suspects, regardless of the real evidence. In a polarised society, as much blame as possible is regularly heaped on the rival pole. But that doesn't mean they didn't do it... As in most conspiracies, the organisers maintain a distance between themselves and the actual acts. It seems likely that a fundamentalist faction, exploiting existing grievances, organised the mutiny or at least harnessed its direction as a means to destabilise the newly elected government and its secularising tendencies. Perhaps the majority of mutineers were unknowingly manipulated by such forces, were mislead and did not expect nor desire that officers would be killed. This has been stated by several participants. Maybe a small minority panicked and the events escalated further than planned. So far, all is speculation. It seems likely that a probable majority of BDR personnel participated to express resentment about their pay and conditions as compared to the more favoured regular army soldiers (there were also complaints of officer corruption); the lack of access to lucrative UN peacekeeping postings being a particular grievance. But the evidence suggests this may have been more an inter-military organisational rivalry than a class conflict between rank'n'file soldiers and and the officer class; the officers imported from the regular national army to oversee the BDR were killed - while the rest of the lower officers native to the BDR were not targeted. "The 40,000 plus border force, spread over 46 battalions, consists of non-commissioned officers who rarely go beyond the rank of major." So not necessarily a clear and simple class divide. One must also consider that the mutiny may have been backed by a pro-Islamic faction in the military - existing within both the BDR and the national army - and who may have used genuine rank'n'file grievances for their own attempted ends. Some commentators are convinced of this, and point to the likely involvement of Pakistani intelligence, who fear damage to their 'ideological legitimacy' if the trials of war criminals go ahead. (5) But these blamings and accusations, whether accurate or not, will be used anyway by various factions to try to gain political advantage against their rivals. There have been simplistic claims by some internet leftists that this was a clear class conflict between rank'n'file soldiers and their officer class. Even if that is how it was perceived by some of the mutinous soldiers, that does not make it the whole truth or mean that they were definitely free from unseen manipulation. Various forces had potential vested interests to pursue in the mutiny, its outcome - and now, its political and historical interpretation. Equally, moderately impartial, dispassionate, unbiased media commentators are rare (this also applies to those quoted here). Time may reveal a clearer picture and confirm or correct our present opinions. One must also remember that the BDR, as well as undertaking border patrol, are sometimes used to police the widespread workers' unrest in the Bangladeshi garment industry. So any useful expression of class solidarity would be expressed more by refusing that role (as, in the context of the financial crisis, soldiers in Ireland have just stated) - than by demanding equal access to UN 'peacekeeping' roles, which are predominantly just exercises in imposing the geo-political interests of Western powers. 2) Though, as modern communications technology and the mass media it transmits penetrates more widely throughout Bangladeshi society, these traditional folk forms are reported to be fading and losing any life of their own. Presumably, as elsewhere, they will gradually come under the lonely jurisdiction of academic 'collectors' and tourist entertainments. 4) "Serajul Islam Choudhury, a Professor Emeritus of Dhaka University, said the fundamentalist axis got the chance to debase the culture of the soil because no government in Bangladesh had tried the war criminals in the 37 years of the country’s independence. ‘They want to destroy our local culture and as part of that conspiracy. The bigots, in the name of religion, are protesting against the sculpture that symbolises Lalan and his followers,’ he said. 5) "The immediate background of the BDR uprising could turn out to be a damp squib officially - it will be blamed on long-standing grievances, and “wayward” soldiers. But it takes a greater significance in the light of the recent urging by the emissary of Pakistan to the BD government to drop the proceedings towards war-crimes trials of the Rajakaras and the AlBadrs, Al shams for their atrocities during ‘71. On top of that the AL led government moves ahead with transit and trade agreements with India, a reasonable and pragmatic move on the part of Bangladesh as the country is even now crucially dependent on Indian imports of essential commodities. This draws immediate vehement protests by the nearly decimated BNP, as expected. Just like many political parties in Pakistan, a lot of political careers are made in Bangladesh by inflating up the “demonic” “Hindu” India. However, it is Pakistan’s palpable fear at possible re-exposure of Pakistan’s role in the ‘71 war of liberation that is significant. Admin; spamming by anti-Indian Bangladeshi "patriot" removed. Don't post long articles, only links.